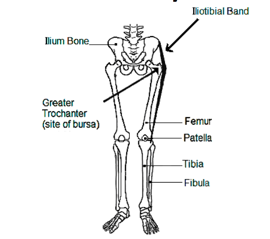 The Iliotibial band or ITB is a length of gristle-like tissue that runs down the outside aspect of the thigh as shown in the diagram to the right. It is made from very tough tissue called retinacular fibres which are largely unable to be stretched. As you can see, the band changes direction around a bump of bone near the hip joint. This is located where the buttock develops a ‘dimple’ when you clench the gluteal or buttock muscles. The pain of iliotibial band syndrome usually occurs at that point in the lateral or outside aspect of the buttocks and can be felt if the area is pressed. This means that the painful area is close to the surface of the body. If you can touch the painful spot, be reassured that it is not hip joint pain as your hip joint is too far inside you to be touched. Pain can also occur in the hard strip you can feel on the outside of your thigh or where the band starts or finishes as shown in the diagram. This problem is also frequently misdiagnosed as sciatica or ‘referred pain’. The pain arising from sciatica is in the rear of the buttock / thigh. The pain associated with iliotibial band syndrome is in the outside of the thigh. It is not referred pain from a compression of a nerve from the back. Pain will occur while walking, while lying on the affected side in bed and often while lying on the other side, if the sore leg is allowed slump toward the middle and touch its knee to the bed. You may have learned you can sleep best with a pillow between your knees. What makes iliotibial band syndrome painful? In females, the bump of bone labelled the greater trochanter is much more prominent than it is in males. This makes the angle that the band has to deviate greater to start with. In pronators (people whose feet roll in), not only are the feet affected but the whole limb will rotate inwards (towards knock knee). This further increases the angle that the band makes over the bone. It also increases the distance between the start and finish of the band by up to 6 mm as the shortest distance between two points is a straight line rather than a kinked one. As the iliotibial band cannot stretch, this makes it very tight and presses the band against the bone harder than it should. Pronation also causes the band to ‘flick’ across the bony bump – particularly with a shiny floor / slippery shoe combination. If you have had other therapy for this condition, you have probably been told that the band is tight and needs to be worked on to stretch it. This is very different to our understanding of the condition where the band is a static length but its attachment points have moved away from each other making it ‘tight’. In between the bone and the band is a small fluid filled sack called a bursa. It look not unlike an oversized jelly-bean. Too much pressure from the tight band will cause it to become inflamed (called bursitis) and painful. As the bump is technically called the greater trochanter, this condition is also referred to as trochanteric bursitis. Men are far less likely to be afflicted with iliotibial band syndrome than women but often have a severe case if they are. What can be done for iliotibial band syndrome ? As described earlier, the band is made of unstretchable retinacular fibres. Massage is very painful and (in my opinion) of no benefit. As the bursa itself is a self-contained sack of fluid, it has no significant blood supply, explaining why nearly all anti-inflammatory medications don’t work. The drug cannot get delivered efficiently to the site of the pain. Codeine, which acts within the brain, is the exception to this and will supply some short term relief. Codeine may be detrimental to the digestive tract in the long term and cause constipation in the short term. Topical anti-inflammatory rubs cannot penetrate the thick gristle to reach the inflamed bursa below. Physical methods of reducing inflammation such as heat and ultrasound will help until the area is irritated by the next day s walking again. Happily, this condition responds very well to treatment. Using custom made plates called orthotic devices that go into your shoes, we can stop the excessive foot pronation and limit the amount of internal rotation occurring in the leg. This will return the band to the correct length and stop the excessive pressure on the bursa. This rotation is quite difficult to control, needing perfectly fitting orthotics and for this reason one-size-fits-all insoles from sport shops or chemists are not suitable to treat iliotibial band syndrome.